The On-Stage DS7100C Basic Fixed-Height Desktop Stand with Chrome Shaft has a solid base with rubber feet for stability and a removable shaft. Box Dimensions (LxWxH) 6.5 x 6.4 x 1.0"
DS7100C Basic Fixed-Height Desktop Stand with Chrome Shaft is rated 4.5 out of 5 by 23. Rated 5 out of 5 by Stephen G. from Great lowcost solution Very simply made so nothing can go wrong. Really like everything about it especially the price. Rated 5 out of 5 by Vintage Microphone Collector from Great Simple Microphone Desktop Stand I ordered 3 of these to display some of my vintage microphone collection. Sometimes you just need a basic mic desk stand: no boom, no height adjustment, etc. The price was unbeatable! The 5 rubber feet add a lot to the stability. It even supports the offset shock mount on my studio condenser mic! The height is tall enough to accomodate the downward-facing microphone connectors on my vintage mice. Highly recommend. Rated 4 out of 5 by Anonymous from Good Stand I use this for border mics for video/performance recording. They are good for the price. Serve their purpose and are well built/durable. They dont have the best insulation from the stage, depending on the surface, they transfer allot of vibration to the mic. This makes it difficult on a wooden stage with dancers for example. Place them on more solid ground or on a sandbag for a quick solution. 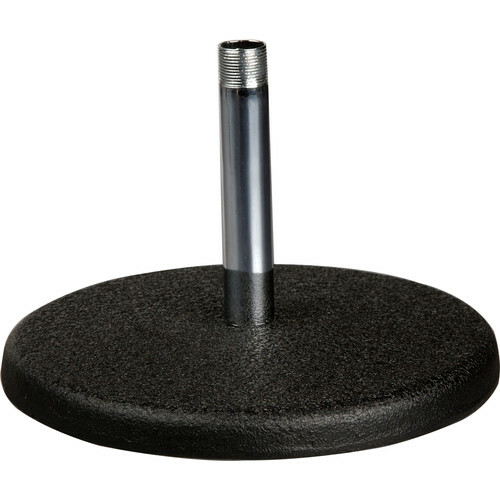 Rated 4 out of 5 by Anonymous from gets the job done This is a basic, sturdy table-top mic stand. If you need one that telescopes, you can spend a little more for one that changes height, but for my purposes, this one was perfect. Very solid construction and build. And it's dang cheap! You will need to purchase a mic clip if you don't already have one for your mic. Rated 5 out of 5 by Jon from A Bargain! It's under $10. It's solid, and I don't see myself replacing this thing... ever. It's perfect for my needs, it decently made, and I love it. It's exactly what I expected it to be and anyone doing in house recording needs one or more of these, sometimes a mic stand is just too much and this fills in that gap. Rated 5 out of 5 by Anonymous from PERFECT! Desk-top mic stand. This mic stand is just the right height for your desk top microphone. It does not take up much space with its 6 round base and rubber pads. It also, is heavy enough so it won't tip over easily. I suggest getting a (jam or lock nut) as they are called, to lock the mic mount securely to the stand. Rated 5 out of 5 by NJ Nice from A Very Good, Must Have Microphone Stand I have purchased this stand for my church for my Shure SM58 Wireless Microphone System T258 Diversity System. It is a must have for protecting any of your microphones from damages. It is just right for my church pulpit podium. It is great for any desk as well! Rated 4 out of 5 by Anonymous from Sturdy, but a little short. Very sturdy mounts for tables, but if you have a stick microphone, they might be a little short. I have a studio mic with a shock mount that allows me to point the mic upward and it's easy to use there - not so sure about stick mics though.